Recently completed project near Lake Murray, SC. As a natural extension of the home’s ground floor, a patio significantly expands a family’s living and entertaining space. It provides a perfect gathering spot for guests and family who will be drawn indoors to this enticing space. Concrete and paver patios are attractive, weather resistant, and extremely functional for your outdoor recreation and entertaining needs. When you install a custom-designed patio in your yard, you will create a beautiful new space that is perfectly suited to your home. Here is a quick look at some of the great benefits of a concrete patio. A hardscape will provide you with fantastic design versatility as well as functional versatility. No matter the style and landscaping of your yard, you will be able to create a patio that matches your taste with the use of pavers or special stamping and shaping tools that will allow you to make your new concrete patio your very own. The physical structure lends itself to a multitude of uses: wheel in a portable bar and you’ve got a great place for cocktails and mingling; add several seating arrangements and the conversation circles abound; place a large dining table and chairs in the center and you’re ready for dinner party al fresco; or clear the whole space, turn up the tunes and you and your guests can dance the night away! Along with being incredibly versatile, patios are also extremely durable. When you install a new hardscape in your yard, you will be creating a highly functional space that can stand up to the demands of daily life and will last for many years to come. Your patio will withstand inclement weather such as snow and rain. A patio is easy to maintain. Unlike a wooden structure, hardscapes will not become damaged by termites or extreme weather conditions. 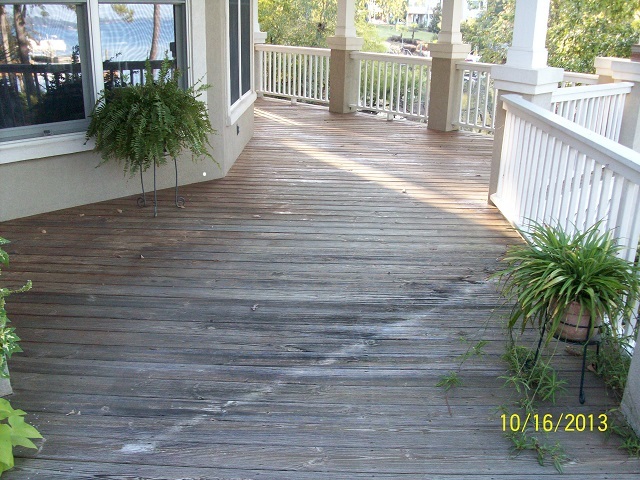 In addition, your patio will be incredibly easy to clean on a routine basis. NE Columbia fire pit and patio addition. 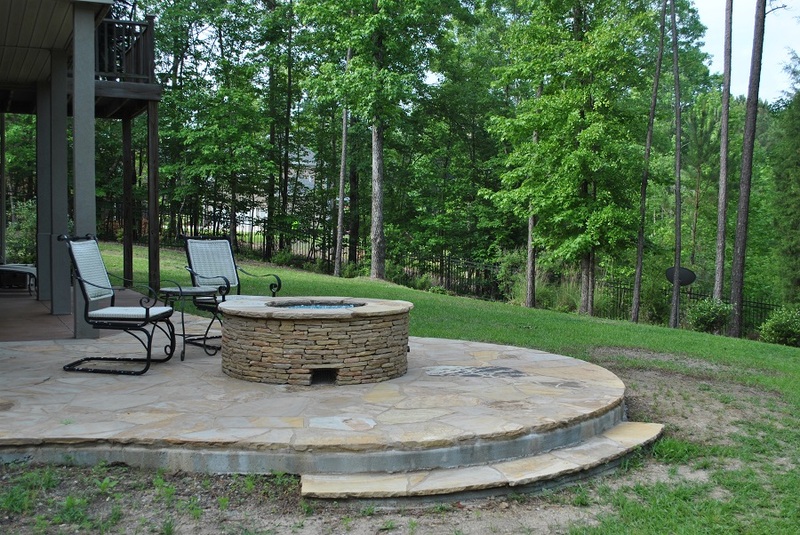 Our Northeast Columbia project combined a fire pit and patio with a step down into backyard. The hardscape area of this outdoor living space provides a conversation area surrounding the fire pit and ample space for the homeowner and guests to mingle and socialize while enjoying the warmth and beauty of the fire. Truly a masterful combination of structures and space for these homeowners to enjoy. 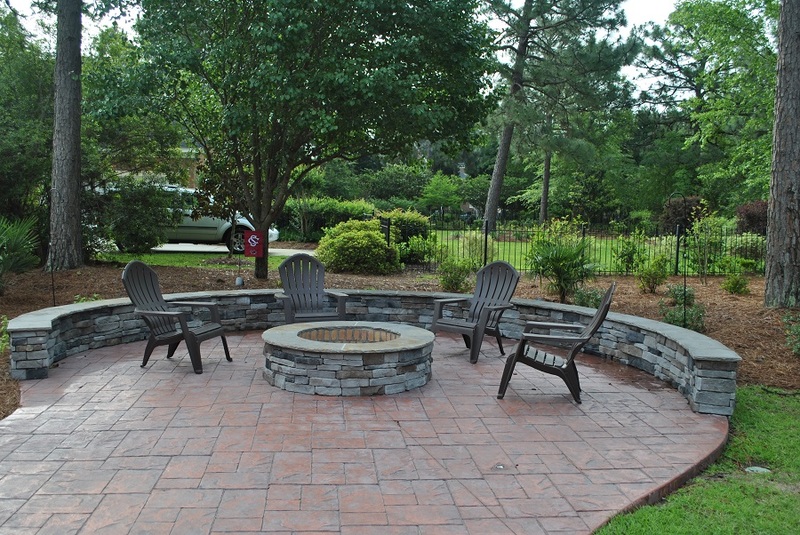 Patio and custom fire pit near Lake Murray, SC. At this Lake Murray home, we custom designed and built an outdoor living combination space that included a patio, retaining wall and fire pit along with a screened porch and a deck. To further stretch the enjoyment time, each structure in this outdoor living oasis is constructed with low maintenance materials. The patio is made of stamped concrete, the retaining wall and fire pit use synthetic stone facing, the screened porch is aluminum and the deck is constructed with AZEK composite decking in Hazelwood. As you can see in the pictures above, this stunning design is quite an extensive project and totally transforms this backyard. 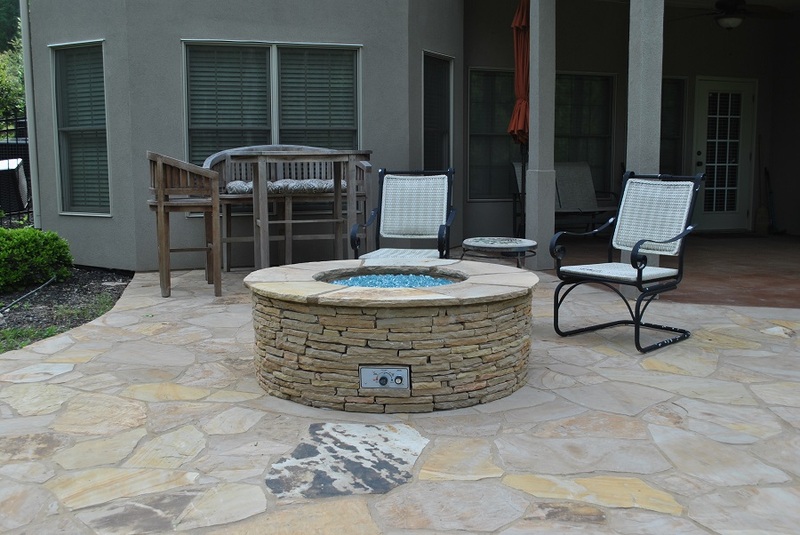 The patio is vital to the flow of the design and connects the deck to the fire pit. Simply GORGEOUS! 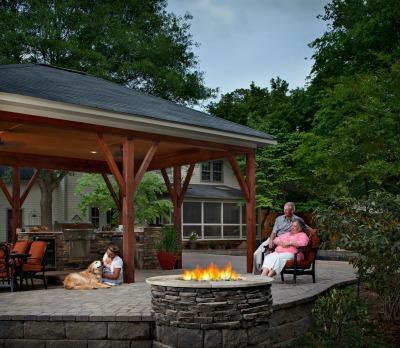 If you’re ready for a true extension of your home with function and flow to help you get MORE out of your outdoor living space and backyard this season, contact Archadeck of Central South Carolina today! We’ll help you discover how a combination outdoor living space including a hardscape/patio will help you get the most out of your outdoors, too! 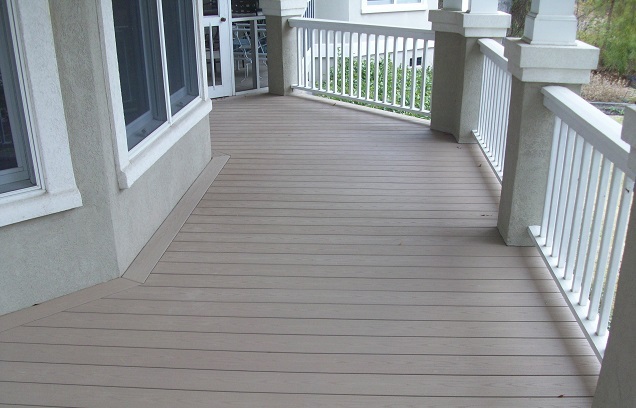 Call us at (803) 603–2160 to schedule a free consultation or email us at centralsc@archadeck.net. This entry was posted in Custom Outdoor Fire Pits, Custom Outdoor Living Designer & Builder, Decks, Outdoor fireplace and fire pits, Outdoor Living, Outdoor living combination structures, Patio, Patios and Hardscapes and tagged Archadeck of Central SC, Archadeck of Central South Carolina, AZEK composite decking, Central SC combination outdoor living spaces, Central SC patio builder, Custom Central SC firepits and outdoor fireplaces, Lake Murray SC Deck Builder, Lake Murray SC patio builder, Making your Columbia SC dream backyard a reality, NE Columbia Sc Patio builder on May 28, 2015 by archadeckofcentralsc. 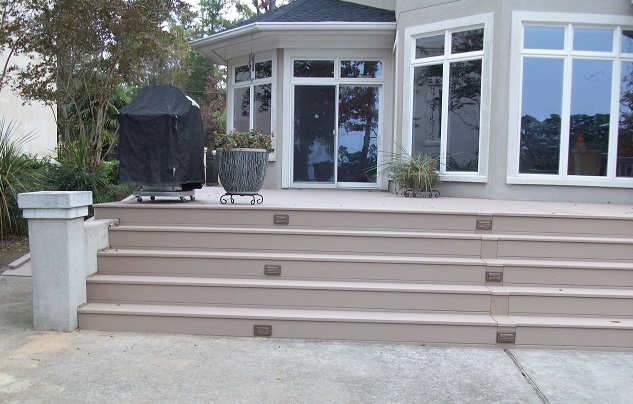 This lakeside pressure treated deck includes built-in bench seating, and unique privacy railing. 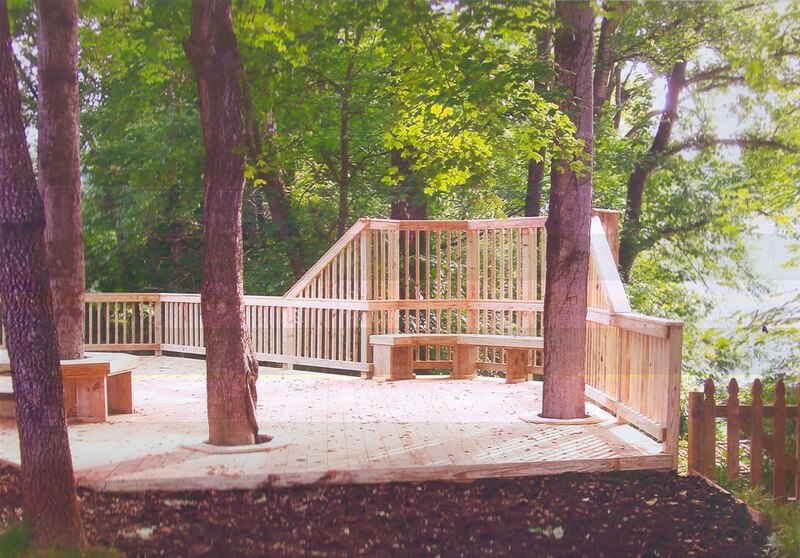 We also integrated the existing trees within the landscape into the design of the deck. 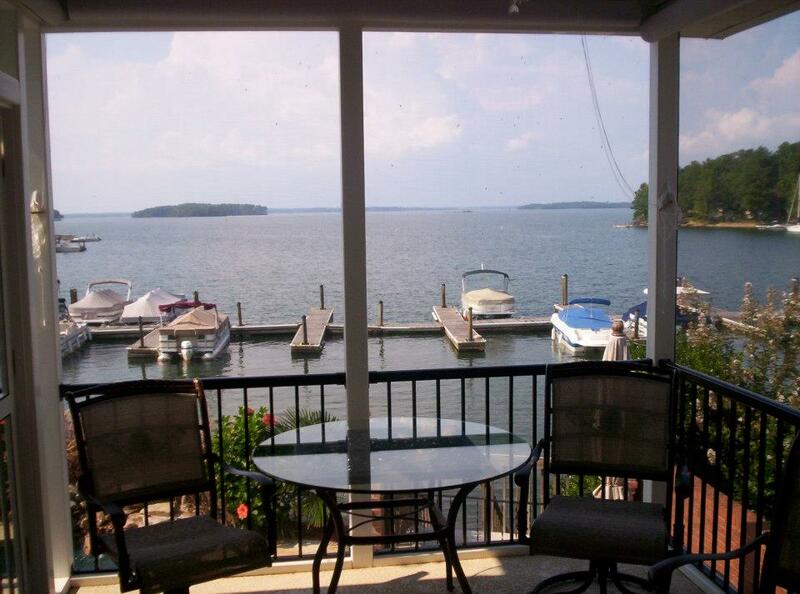 The Columbia area is home to many lakefront living communities. Lake Murray, the Saluda River and Lake Wateree, offer pristine views and the opportunity to experience waterfront living at its best. 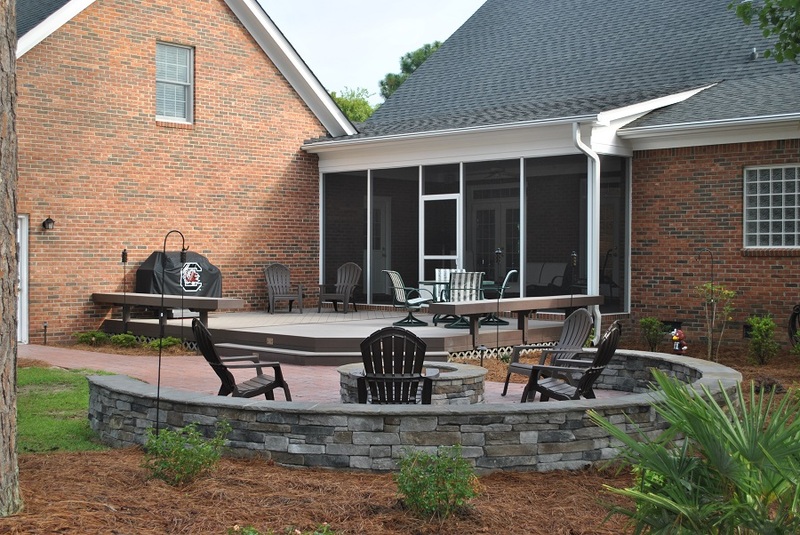 If you count yourself as one of the lucky homeowners situated on one of our beautiful area lakes or rivers, Archadeck of Central SC can turn your lakeside or lakefront home into an outdoor oasis with the many outdoor living space designs we offer to enhance your lakefront living experience. This freestanding lakeside pool pergola with outdoor kitchen by Archadeck of Central SC is the ultimate in backyard bliss! 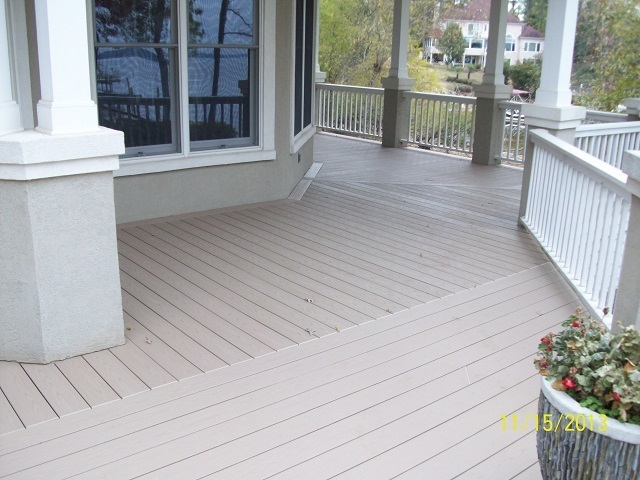 Since the style of lake houses in our region is as varied as the people who live in them, Archadeck of Central SC has a plethora of designs available with a host of materials to suit any taste or budget. Lake houses come in a variety of architectural styles from humble cabins and cottage hideaways, to sprawling lodges and contemporary homes, but each shares the goal of providing rest and relaxation in a waterfront setting, and that is the same goal we try to accomplish with our outdoor spaces. Whether you choose to create a rustic retreat inspired space or a contemporary backyard getaway, we always strive to build a space that is casual, inviting and soothing to the soul. 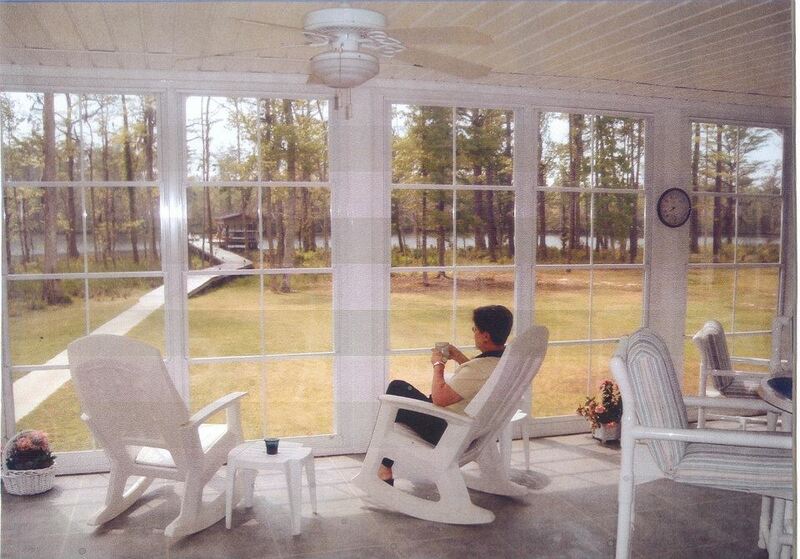 Imagine enjoying your view of the lake from your very own 3 or 4 season room by Archadeck of Central SC. Close your eyes and imagine how much an outdoor oasis would enhance the time you spend outdoors at your lakefront home. Can you see the benefits of having an outdoor space that enables you better views of the lake and a broader realm of entertaining opportunities? Archadeck of Central SC can see it too. 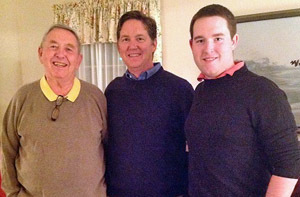 We share the same vision of increasing the beauty and enjoyment at your lakefront home. When it comes to choosing the outdoor space that will best fit your lakeside retreat, the first thing to consider is what function(s) you wish to accomplish in your space. If you enjoy grilling by the lake, then a deck or patio may be your best option. If, however, you dream of having a place to take in the scenic views while not being bothered by insects or inclement weather, a screened porch or versatile 3-season room may be a better fit for the outdoor living lifestyle you have in mind. If you are looking for a way to utilize the best of both worlds, then maybe an outdoor living combination of two or more structures is your best bet. 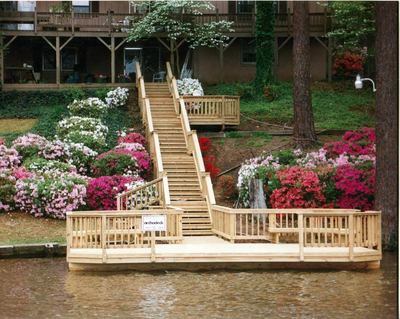 Notice how the ingenious design of this dock connects the deck to the waterfront- stunning! 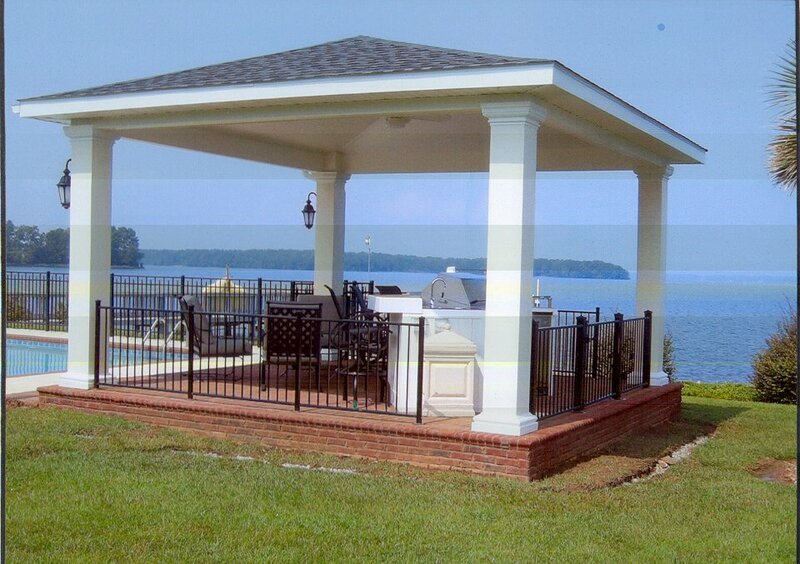 Along with being the Columbia area’s premiere lakeside deck and porch builder, Archadeck of Central SC also builds docks and piers to enhance your lakeside living experience even further. 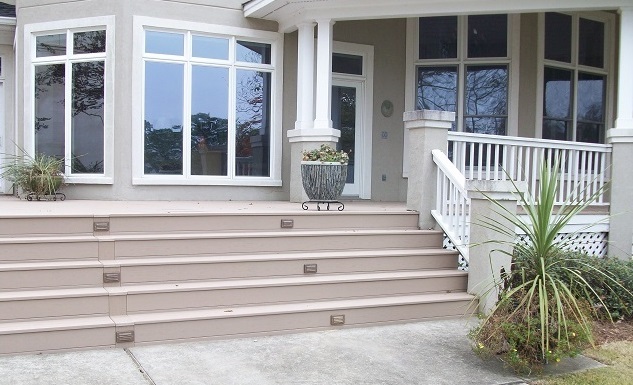 We offer low maintenance options that won’t degrade over time as well as custom wood designs to suit any taste or budget. Wouldn’t it be grand to have a custom dock and outdoor living space combination to get the total lakeside living outdoor space package? Imagine the beauty and convenience of having the “whole enchilada” in your Columbia lakeside backyard; you may never want to venture indoors again! You can see more inspiring outdoor living space designs that hold the capability of turning your lakeside home into a lakeside retreat by visiting our decks photo gallery and our porches photo gallery, located on our website. This entry was posted in Lakefront and lakeside decks, Lakeside and lakefront porches, Lakeside outdoor structure designs and tagged Archadeck of Central SC, Archadeck of Central South Carolina, Carolina Lakes Columbia SC deck builder, Carolina Lakes Columbia SC outdoor structure builder, Central SC combination outdoor living spaces, Central SC deck builder, Columbia SC deck and porch builder, Columbia SC lakefront outdoor structures, Columbia SC lakeside porches, Columbia SC Porch Builder, Lake Columbia SC decks, Lake Columbia SC docks, Lake Columbia Sc outdoor structure builders, Lake Columbia SC porches, Lake Murray SC Deck Builder, Lake Murray SC screened porch builder, Lake Murray SC screened porches, Outdoor living on the Saluda River Columbia SC on September 3, 2013 by archadeckofcentralsc.